The Stonegate Conference & Banquet Centre, Hoffman Estates, Ill. When Trisha and Adam Peterson say they’re best friends, they really mean it. The active, outdoorsy Roselle couple spent nearly a year and a half hanging out as “just friends” before their first date, a romantic Valentine’s Day dinner in 2008. The two met while working at the same life insurance company; Adam had worked there several years and Trisha was fresh out of college. After Adam proposed to Trisha on her family’s yacht, the couple spent a few months researching their future wedding venue. An early choice was The Stonegate Conference & Banquet Centre, 2401 W. Higgins Road, Hoffman Estates, which Trisha daily passes by on her way to work. Once she saw the grand staircase inside and the elegant lakeside pavilion, she was sold. 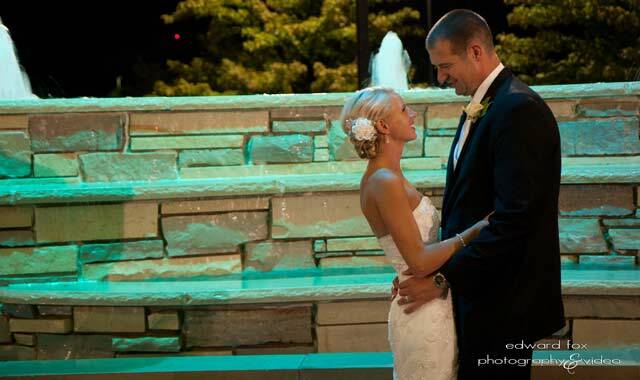 The Stonegate hosts nearly 150 weddings each year and offers at least five flexible options for receptions. Shuttles are available to nearby hotels, and the in-house caterers accommodate unique menu requests such as traditional Southeast Asian or Kosher celebrations. On Aug. 13, 2011, Trisha and Adam celebrated with 160 guests in the Lakeside Pavilion, a tent-like structure that’s draped in white fabric and lit by elegant chandeliers. Available year-round, it’s temperature controlled and has a terrace that overlooks a small lake. Before the big day, Beringer met repeatedly with the couple to arrange floor plans, in-house catering menus and floral arrangements. And on the big day, it was Beringer who made sure the couple stayed composed. Even though another wedding was happening inside the banquet center, each event had its own space, including a personal bridal room for Trisha. “From the second I got there, Beth was there to open the door and had a room for me to relax in before the cocktail reception,” says Trisha. Before guests arrived, the couple toured the pavilion and took photos inside and along the terrace. Looking back, she knows why this venue is something special. “You could tell they spent a lot of time making every detail perfect,” Trisha says. Ceremony: Trinity Lutheran Church, Roselle, Ill.
Reception/Catering/Cake: The Stonegate Conference & Banquet Centre, Hoffman Estates, Ill.
Florist: Elegant Blooms, Naperville, Ill. Photographer: Edward Fox Photography, Chicago, Ill.
Music/DJ: Spinnin Discs, Schaumburg, Ill.
Lake Geneva and its Grand Geneva Resort & Spa hold special meaning for Erin and Mike Nieft. They visited it regularly during the four years they dated, so it was natural to hold their wedding celebration there, too. About five months before the couple’s first trip to Grand Geneva, they had met at a Chicago Bears game. He was from Hoffman Estates, she was from Cary, and they both loved biking, traveling and music. With so much in common, their friendship continued beyond the game. They were married June 18, 2011, at Grand Geneva’s Greenview lawn, which overlooks a small lake and 36-hole golf course. With nearly 120 guests, they celebrated inside the spacious Evergreen Ballroom. The massive ballrooms can hold up to 400 guests, although most weddings host about 175. Take, for example, the tasting room, where resort chefs prepare dining options and décor for couples to select. Minnich sat with Mike, Erin and their parents, offering ideas. But it was the chair and linen options she suggested that surprised and impressed Erin. The silk napkins, which incorporated her purple and gray color scheme, were an instant hit. “What she picked, worked,” Erin says. Grand Geneva hosts about 80 weddings here each year, with as many as five receptions each weekend. Events director Manuel DeMoya says the staff remains flexible, offering a wide range of options, including Friday and Sunday weddings, or afternoon celebrations. Because it’s a resort, couples may choose from among many add-ons, including rock climbing, golfing or trolley rides to Lake Geneva. DeMoya says he’ll even reserve an entire restaurant on the property, to accommodate a rehearsal dinner. Erin took her bridesmaids to the resort’s spa for treatments, makeup and hair. ONLINE EXCLUSIVE: CLICK HERE TO VIEW A TRAILER OF MIKE AND ERIN’S WEDDING. Gown: Volles Bridal and Boutique, Lake Zurich, Ill.
Florist: Lilypots Flowers & Gifts, Lake Geneva, Wis. Photographer: Ruben Ramos/Fred Fox Studios, Schaumburg, Ill.
Videographer: JJ Kim/Orange Wedding Films, Chicago, Ill.
Music/DJ: MDM Entertainment, Schaumburg, Ill. Makeup: Danna “Maddison” from Mario Tricoci, Schaumburg, Ill. Hair: Grand Geneva Resort, Lake Geneva, Wis.
Blake and April Johnson dreamed of a country wedding. The self-described “country bumpkins” wanted something that fit their budget and had the perfect look. As they searched for country settings and barn-like venues, they visited a variety of wedding blogs. One had a stunning picture of a bride at a place called Copperstone Inn, 6702 Yale Bridge Road, Rockton, Ill. The more they learned about Copperstone and its companion Pavilion at Orchard Ridge Farms, the more they knew they’d found what they wanted. “My wife loved it, and she cried the first time she saw it,” Blake says. But there was a problem: The couple lives in Kenosha, Wis. His family lives in Minnesota. Her family lives in Wheaton. It was a hard sell, but they’ve never looked back. “I would do it again in a heartbeat,” he says. Set on 130 acres with a giant reception hall and a seven-room bed-and-breakfast, Copperstone Inn is a prime spot for destination weddings. For out-of-town brides and grooms, the staff provides a list of recommended local bridal service vendors. Blake was amazed by the helpful attitude of the inn’s small staff. “I felt like royalty, the way they took care of us,” he says. Blake and April met one another back in 2006, in Nashville, while she attended school and he lived with a friend there. Nearly four years later they began dating. Although April was his first girlfriend, he knew he’d found his one and only. Soon after they started dating, April moved to Chicago to pursue a nursing degree. Blake followed her, eventually moving to Kenosha, when she transferred to Marquette University, in Milwaukee. On Aug. 19, 2011, the two were married on the hill just east of Copperstone’s pavilion, beneath two old oak trees. The spacious pavilion can hold up to 450 guests, but was arranged to feel cozy for this couple’s 100 guests. “Even though we had a smaller wedding, it was perfect, and the staff helped us to fill up the space,” says Blake. at Orchard Ridge Farms, Rockton, Ill. Catering: ABC Catering, Rockton, Ill.
Cake: Bridal Cakes by Ann, Kenosha, Wis. The Internet has been pretty good to Kate Anderson. It’s how she ended up on TV, it’s how she found many gently used items for her recycle-themed wedding, and – best of all – it’s how she and Ryan fell in love. Facebook had just arrived at the couple’s Indiana college, and Kate was studying in Australia for a semester. Starting a Facebook group for fans of the band Fall Out Boy, she gathered 11 members. When one of them, Ryan, posted a funny comment, she began a semester-long online friendship with him. Their relationship became Facebook official just a few days after Kate returned to campus. “People just assumed we met through friends,” says Kate. Kate won the prize for best venue, for her selection of Blumen Gardens, 403 Edward St., Sycamore. A garden center and small-scale banquet hall, Blumen Gardens is set inside a rustic, 1860s-era factory, with exposed architectural elements and peeling paint accents, mixed with bountiful floral arrangements. The couple served a tier of donuts instead of a cake, and, because it was the weekend before Halloween, incorporated a cut-out board with Frankenstein and his bride into a photo booth. When Kate dug up accent pieces and furniture from the garden center’s storage closet, the staff embraced her ideas. ONLINE EXCLUSIVE: CLICK HERE TO VIEW A TRAILER OF RYAN AND KATE’S WEDDING. Ceremony: DeKalb United Methodist Church, DeKalb, Ill. 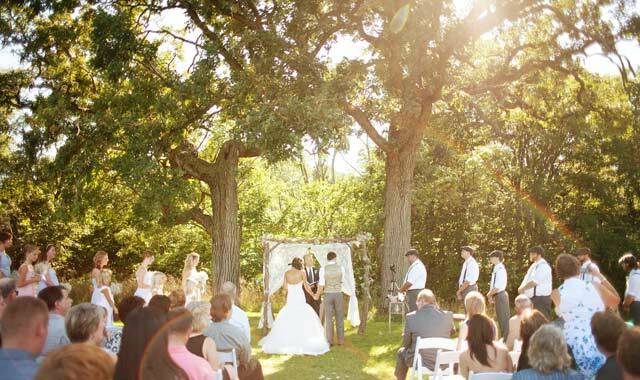 Reception: Blumen Gardens, Sycamore, Ill. Catering: Nat’s on Maple, Sycamore, Ill.
Cake/Donuts: The Neighborhood Bakery, Sycamore, Ill.
Florist: Kar-Free Flowers, Sycamore, Ill.
Carriage: Royal Carriage Ltd., Genoa, Ill. Photographer: Mandy Leonards Photography, Indianapolis, Ind. Videographer: Leap Weddings, Chicago, Ill.
Music/DJ: DJ Chicago, Chicago Ill. Makeup: Laura Deihs Makeup Artistry, surrounding Chicago, Ill. Hair: Imagine Salon, DeKalb, Ill. The Gardens of Woodstock, Woodstock, Ill. When Mary Hausner’s daughter Eleanor was married last summer, her family celebrated twice. In July 2011, Eleanor married Sebastian Haerting, a German, in Berlin. A few months later, the newlyweds celebrated in America. The couple met in 2005 through mutual friends, at a party. Eleanor, a Dundee native, had recently arrived in Berlin, to teach at a school for native English-speakers. Despite their cultural differences, the two were instantly attracted. While Eleanor planned the German celebration, Hausner organized a reception for American family and friends at The Gardens of Woodstock, 5211 Swanson Road, Woodstock. The date was a moving target, as her daughter made time in her school schedule for the international flight. Throughout the planning process, Gardens of Woodstock co-owner Mike Balleto remained flexible for the October reception, which was at the tail end of his summer wedding schedule, says Hausner. Typically reservations are made three to six months in advance. Balleto stationed an outdoor buffet line under an awning, and the DJ under a gazebo. He arranged seating on the patio and in the banquet room. With natural fall color and soft garden lighting, no fancy embellishments were needed. The garden spoke for itself. The casual, low-key reception attracted nearly 100 guests, who enjoyed strolling the well-manicured gardens and watching a big-screen TV that displayed photos from the German ceremony. “It was wonderful,” says Hausner. 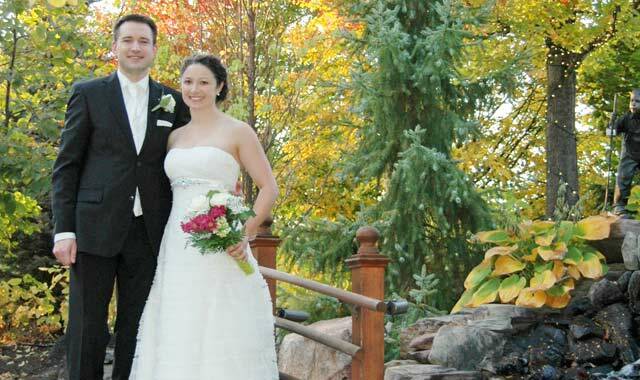 Reception/Catering: The Gardens of Woodstock, Woodstock, Ill.
Starved Rock Lodge, Utica, Ill. Things have a way of clicking into place for Jeremy and Heather Roark, of Champaign, Ill. As transfer students in the pre-veterinary program at Murray State University, Murray, Ky., they saw each other in every class. At the school farm where they worked, they were routinely paired together and their personalities instantly clicked. While planning their wedding, they thought about the way each of their families had enjoyed hiking and camping, when they were growing up. 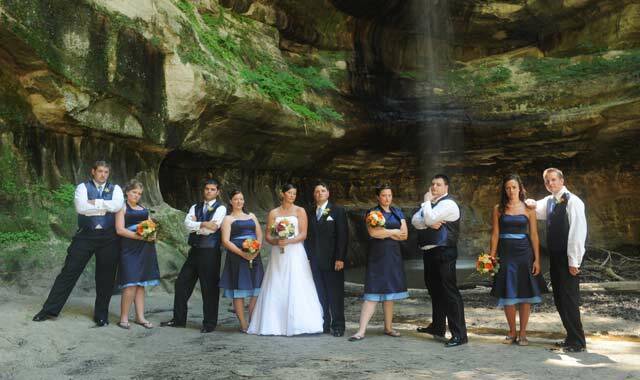 Heather and her family often took trips from their home in Sandwich, Ill., to Starved Rock State Park in Utica, Ill.
After some research, the couple knew they had a venue. 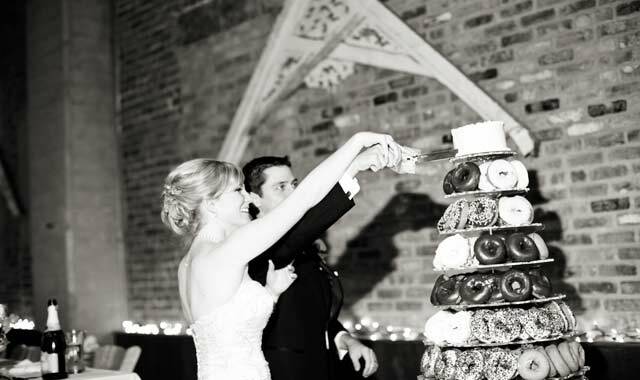 During the annual bridal expo at Starved Rock Lodge, they arranged for catering, a custom cake, photography and DJ services – all through the Lodge. Best of all, Lodge staff helped Heather to do the rest of her planning long-distance, while she finished school in Kentucky. Kathy Casstevens-Jasiek, the Lodge’s marketing director and the photographer for the Roarks’ wedding, had special insight into the venue: she had staged her own wedding there, just a year before Heather. 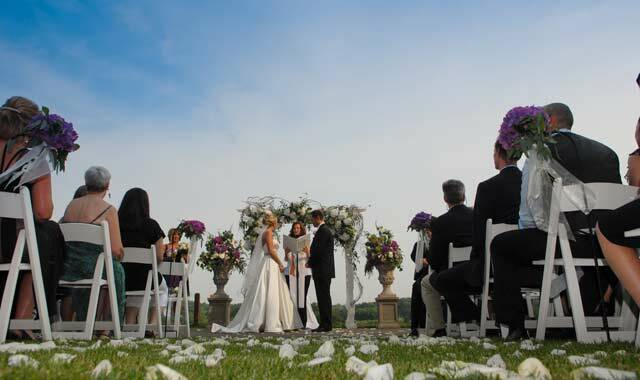 The park sees about 122 weddings each year, and Casstevens-Jasiek knows that hosting a flawless wedding is no small task. At Starved Rock, backup plans are always in place. The Roarks’ big day was flawless. Before the ceremony, the couple, their family and wedding party hopped on a trolley for a ride around the park and photos in the scenic canyons. Following the 5 p.m. ceremony in the outdoor Sunrise Shelter, the couple hosted a reception in the Great Hall, with nearly 200 guests, many of whom stayed at the Lodge. Now Heather’s brother Jake is planning his own wedding at Starved Rock. And, like most couples, he and his fiancée are working on it far in advance. Weddings here are already scheduled for 2014. Cake: Starved Rock Lodge, Utica, Ill.
Florist: Regina Little, Sandwich, Ill.
Music/DJ: Get Up & Dance DJ, Ottawa, Ill.
From the day that Joe Burley proposed to Amy, the Cary couple knew they wanted a romantic river view wedding at Goldmoor Inn, 9001 N. Sand Hill Road, Galena. Joe had proposed to Amy at his grandfather’s Galena-area property, and the couple had enjoyed a romantic dinner at the Goldmoor afterward. “He reserved a room and we ate dinner there, and he had told the Goldmoor about us,” she says. “They made a special cake that said, ‘Congratulations Joe and Amy,’ on it.” When they went upstairs to their room, romantic music was playing. Right away, they booked Memorial Day weekend for their wedding, because it was a time that was significant to both families and accommodated Joe’s work schedule. The family-owned bed-and-breakfast hosts weddings big and small throughout the year, offering a variety of indoor and outdoor spaces suitable for ceremonies and receptions. With 18 guest rooms and space for nearly 200, the property offers breathtaking views of Mississippi River backwaters and Galena’s rolling hills. “A lot of brides are amazed the first time they step out of the car and see the view across the river,” says Erica Wall, wedding coordinator. Wall assumed planning duties for the couple’s wedding just three months before the big day. The couple thinks of her as their caped crusader, because she smoothed out so many rough spots during the planning process. Just hours before the wedding, when both bride and groom were anxious, Wall came to the rescue yet again. Although their relationship culminated in a romantic riverside wedding, it began in the workplace. Amy had noticed Joe in the mortgage lender office where they both worked. At the advice of a mutual friend, she began conversations with him whenever possible. In late summer 2009, Joe and Amy set a group date at a Palatine bar. “We ended up closing the bar together, because we just kept talking,” she says. The Sunday afternoon wedding, under the Goldmoor’s pavilion, went off without a hitch. Wall arranged seating so guests could enjoy the scenic views, and she planned a long, winding entrance for the bride. “I wanted to make that a special moment for my dad and I – he’s my best friend,” Amy explains. Couples book the entire Goldmoor property or just a few rooms for weddings and elopements. Receptions may include custom catering by inn chefs, or fine meals in the dining room. Wall is always prepared. Ceremony: Goldmoor Inn, Galena, Ill. Reception: Eagle Ridge Resort & Spa, Galena, Ill. Catering: Eagle Ridge Resort & Spa, Galena, Ill.
Cake: MainStreet Cheesecakes, Galena, Ill. Gown: Here Comes the Bride, Addison, Ill. Jewelry: Razny Jewelers, Addison, Ill. Photographer: Picture4Ever Studio, Chicago, Ill.
Music/DJ: Jojo and Gizep, Addison, Ill. Chair Rental: Covered Affairs, River Grove, Ill. This entry was posted on Wednesday, June 27th, 2012 at 11:59 am	and is filed under Northwest Woman. You can follow any responses to this entry through the RSS 2.0 feed. Both comments and pings are currently closed.